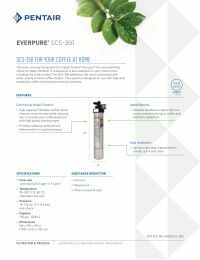 The Everpure SCS-350 Softening Cartridge is the replacement filter for the SCS-350 Filtration System, designed for use with high-end coffee and espresso brewing machines. The Everpure EV9270-20 filter has a unique three-stage blending process to provide softened, buffered, and high quality filtered water for residential coffee and espresso brewing machines. NOTE: For the highest quality water filtration, replace your filter cartridge annually, when capacity is reached, or when flow is diminished.